Oregano is a common herb belonging to the mint family, native to certain parts of Europe and Eurasia that produces purple flowers and aromatic leaves. It prefers warm climates where it is a perennial but in colder areas it generally does not survive the winter. Used extensively as a culinary herb in the Mediterranean, it is also used medicinally in Europe and in China. Sometimes referred to as wild marjoram, its Latin name is Origanum vulgare. Depending on where the Oregano grows, the oil obtained from the leaves contains between 20 and 80 constituents with the monoterpenoid phenols carvacrol, thymol, p-cymene and terpinene being the most common and the most important. Oregano Oil is rich in minerals, especially iron, magnesium and zinc. It also has copper, potassium, niacin, boron, manganese, vitamins K, C, A, riboflavin and thiamine. There are many species of oregano and much confusion as to what constitutes the best medicinal variety. Many herbs with the name are merely oregano-like and are more likely to be marjoram or Mexican sage. High grade, genuine Oregano Oil should be high in carvacrol (above 40%) and low in thymol (less than 5%) for the best results. Despite the lowly designation of ‘common herb,’ oregano yields one of the strongest antimicrobial oils, effective against broad spectrum microorganisms and 25 bacteria, including pneumonia, strep and candida albicans. The all-important carvacrol in Oregano Oil reduces infection as effectively as traditional antibiotics, even at a relatively low dose, all without the side effects and bacterial resistance that plague antibiotic treatment. 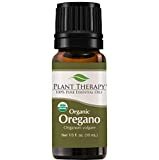 Oregano Oil does not harm the beneficial bacteria in the gut, is safe and inexpensive to use, yet has been called “the most powerful plant-derived antiseptic known. Besides being antibacterial, Oregano Oil is also antiviral, antifungal and antiparasitic. Compared to rosemary, sage and coriander oils, oregano oil shows the highest and broadest antioxidant, antibacterial and antifungal activity. It boosts immunity and is especially effective against allergies, Candidiasis, chronic fatigue syndrome, and fungal infections. It can stimulate a sluggish lymphatic system, reduce pain and inflammation, stimulate the flow of bile and lower blood pressure. Because it rids the body of parasitic infections, it can ease a whole host of other symptoms. To top it off, Oregano Oil is anti-mutagenic and anti-carcinogenic whilst being nontoxic to humans. Oregano oil can be used topically but only after dilution with a carrier oil like olive or almond oil. As a ‘hot’ oil it can cause a chemical burn if too much is applied to skin in its neat form. It can be used for sprains, stiffness and swelling in a pack and is effective for all skin infections and disorders like athlete’s foot, acne, pimples, itches, eczema, psoriasis, parasites and head lice, as well as fungal infections and irritated gums. A few drops of Oregano Oil taken daily in juice can ward off colds and flu and is a potent parasitic remedy and digestive aid as well as an immune booster and tonic. It’s great for allergies, respiratory and other infections, candidiasis and convalescence. Mix the Oregano Oil with the spoon of honey and swallow. Follow up with a large glass of water if you find the taste too harsh. Oregano Oil like most essential oils is very strong and must be diluted in another substance (i.e. carrier oil. honey etc.). This is a fairly pleasant method of ingesting this Marvel Oil, which has been found to be very effective for relieving the symptoms of Sinusitis. Caution – Oregano Oil should not be used by pregnant, lactating women, or for children.